Penn State trustees approved shorter term limits today that won’t apply to themselves. The new 12-year limits will take effect on July 1 and apply to those elected starting in 2013. Existing trustees will still be able to serve five three-year terms, for a total of 15 years. 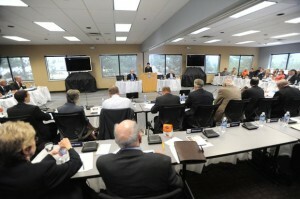 The proposal will also apply to board members who were elected before 2003. Term limits previously didn’t apply to those trustees, and they could have stayed on the board for life. The board approved the proposal unanimously without discussion. The 12-year limits are an improvement, but far longer than what should be allowed. The President of the United States can’t even serve 12 years. Instead, trustees should be allowed to serve no longer than two three-year terms. That’s plenty of time to be a board member, and something I campaigned on. Trustee James S. Broadhurst, whose committee created the plan, said anything shorter that 12 years could have caused half of the board to turn over at the same time. But what’s the harm in that? The new limits should also apply to sitting trustees. If 12-years is the right length, then what are they afraid of?